Director Jon Favreau’s 2008 “Iron Man” movie was so much fun that it would be tough not to go into the sequel with high expectations. Unfortunately, “Iron Man 2” is neither as exciting nor well executed as the first film. Favreau is still at the helm, and the movie is entertaining enough to satiate comic book fans looking for explosive action, but it isn’t as focused or intelligent as its predecessor. The movie picks up where “Iron Man” left off, with industrialist Tony Stark (Robert Downey Jr.) admitting to the world that he is the armored hero. 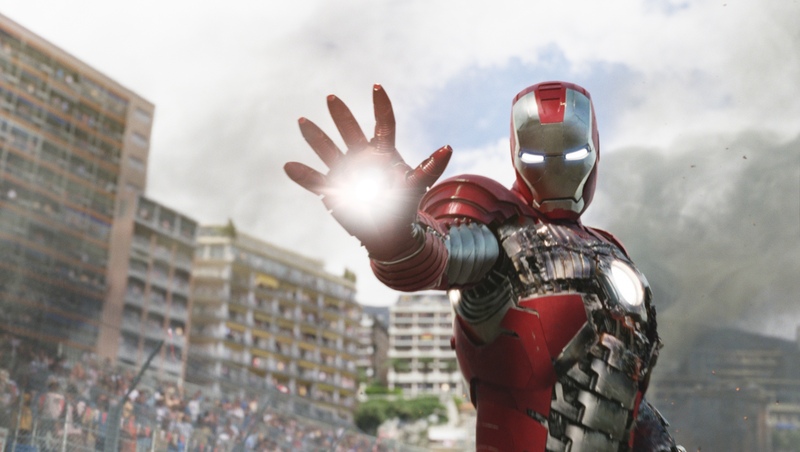 This prompts the U.S. government to demand that he turn the Iron Man suit over to the military. He refuses. The government isn’t Stark’s only problem, though. The arc reactor that is keeping his heart beating is also poisoning his body, and Stark realizes that he will die if he can’t find a solution. In the meantime, an obsessed Russian named Ivan Vanko (Mickey Rourke) has whipped up a suit that he believes is superior to Iron Man’s, and he attacks the hero. As in the first film, Tony’s primary confidants are his assistant, Pepper Potts (Gwyneth Paltrow), and his long-time friend James Rhodes (Don Cheadle). The latter gets to suit up in a modified version of Tony’s old armor, bringing the hero War Machine into the franchise. Tony also gets a hand from a new character played by Scarlett Johansson. Obviously, there’s a lot going on in the movie, and that’s one of the problems. Films tend to be better when they take one or two ideas and develop them, allowing audiences to form an emotional connection with the characters. The cast is solid in “Iron Man 2,” but the picture is so busy overall that it’s not as charming or entertaining as the original. The movie is available as part of multiple home video releases, including a three-disc DVD/Blu-ray combo package. Extra features vary. “Get Him to the Greek” isn’t exactly a sequel to “Forgetting Sarah Marshall” but it is a direct descendant. The latter film tells the story of a Los Angeles composer trying to recover from the fact that his long-time girlfriend is having an affair with a drug-addled rock star named Aldous Snow (Russell Brand). “Get Him to the Greek” puts the spotlight on Snow, whose career has been in a downslide since he released an ill-advised concept album. A young music executive named Aaron Green (Jonah Hill in a different role than the one he played in “Sarah Marshall”) proposes that his label sponsor a performance by Snow to celebrate the 10th anniversary of a famous concert at the Greek Theatre in L.A. The label head (Sean “P. Diddy” Combs) goes for it and assigns Aaron to pick Aldous up in England and bring him to the show. Aaron is a straight-laced guy who is ill-prepared for the drug- and booze-fueled journey that Aldous insists on. In relatively short order, he finds himself in trouble with his girlfriend (Elisabeth Moss) and in serious danger of failing to reach the Greek on time. “Forgetting Sarah Marshall” was one of the funniest comedies of 2008, and “Get Him to the Greek” looks like it will claim similar honors for 2010. That shouldn’t come as any surprise, as Nicholas Stoller directed both films, and Brand and Hill just keep getting funnier. The movie is available as part of multiple home video releases, including a two-disc special edition DVD. Extra features vary. During its first 45 minutes, “Babies” is an intriguing and sometimes eye-opening look at human childhood. Then, it keeps going … and going … and going. As a documentary, “Babies” is unusual in that it avoids narration, instead telling its story with visuals and natural sound. This feat is impressive because director Thomas Balmes is documenting the first year of life of children from four different countries. That means most U.S. viewers won’t even understand the peripheral discussions captured on film. It’s a tribute to the footage Balmes gathered that the language doesn’t matter. Viewers watch as the children – Ponijao from Namibia, Bayarjargal from Mongolia, Mari from Tokyo and Hattie from San Francisco – go through their daily routines. The cinematography is rich and beautiful, and the story is universal. Trouble is, babies don’t do an awful lot in their first year of life, so once viewers have grown accustomed to the significant cultural differences shown on screen, the project wears thin. Since most Americans are clean freaks, they will probably be shocked to watch Ponijao crawl around in the dust and dirt constantly. They may also be distressed when a rooster struts around little Bayarjargal’s bed. Still, the footage is worthwhile because it reminds us that many things that seem shocking in our culture are commonplace elsewhere. Had “Babies” been trimmed and released as an hour-long TV show it would have been fascinating and worthwhile. As is, the movie makes some interesting points, then rambles on way too long. DVD extras include a featurette that looks at the movie’s featured babies three years later. DC Comics’ latest animated movie teams Superman, Batman and Wonder Woman in an adventure documenting the beginnings of Supergirl. It also pits all three heroes in a deadly battle against the super villain Darkseid. When a mysterious woman plummets to Earth in a spaceship, Superman is delighted to find that she seems to be a long lost Kryptonian relative named Kara. Because she possesses immense power on Earth, Superman and Batman agree that she must be trained before she is allowed to wander unescorted. So, they ask Wonder Woman to work with her. Before her training is complete, however, Kara is kidnapped by the villain Darkseid, and Superman and company mount a dangerous rescue mission. “Apocalypse” is filled with action sequences, and the animation is solid for a direct-to-video cartoon. Sadly, the plotting of the film isn’t nearly as solid as the visuals. The movie is available as part of multiple home video releases, including a two-disc DVD/Blu-ray combo package. Extra features vary. “The Killer Inside Me”: Based on the like-titled 1952 crime novel, this film stars Casey Affleck as a small-town sheriff hiding a dark secret. Kate Hudson and Jessica Alba also star. Directed by Michael Winterbottom. “Good”: World War II-era drama starring Viggo Mortensen as John Halder, a successful German literary professor enlisted by the Nazis to push their euthanasia agenda. The story, by writer C.P. Taylor, was originally presented as a Broadway play. Directed by Vicente Amorim. Criterion war films: The always-great Criterion collection is adding two World War II dramas to its library: “Merry Christmas Mr. Lawrence” and “The Thin Red Line.” “Lawrence” is the story of a British officer being held as a POW in Japan during World War II. David Bowie and Tom Conti star. “Thin Red Line” is a Terrence Malick-directed movie about the battle for Guadalcanal. Sean Penn, Nick Nolte, Elias Koteas and Woody Harrelson star. “Ellery Queen Mysteries” – The Complete Series: 1970s television series focused on mystery author Ellery Queen (Jim Hutton) who uses his intellectual abilities to help solve crimes for the New York City police department. This boxed set includes all 22 episodes on six DVDs. “Astonishing X-Men – Gifted”: First installment of a three-part motion comic series centered on the X-men superhero team. The story, which includes the characters Wolverine, Cyclops, Beast and more, revolves around a doctor who develops a “cure” that could relieve all mutants of their special powers.